A work exploring the presence of objects concerning the situation of our increased (scientific) knowledge which remains in a contradiction to the appearance of objects (of the material world). THING has a lot to do with the fascination about the quality of the unexplained. 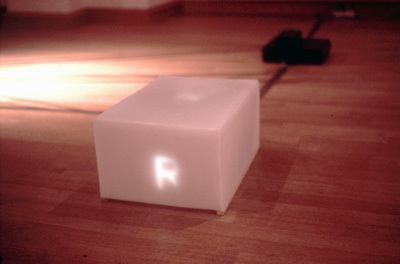 The video projection is situated inside of the white wax object. The words SILENCE and TRUTH are split into their letters. One letter is slowly dissolving into the next one. THING still experiences the process of time and external impulses and as a result the shape is in an uninterrupted change.